Trump’s NAFTA 2.0 Puts Big Pharma First, America SecondTrump says lowering pharmaceutical prices is a priority. But his trade deal would bar Congress from curtailing patent monopolies on biologic drugs. With New NAFTA Deal, Trump Avoids Disaster But Falls Short on Big Trade PromisesCanada has signed on to a deal that shores up and modernizes the existing trade system, but fails to address major issues that animated Trump voters. U.S. and Canada Strike a Deal to Save NAFTAIt will be called the “United States-Mexico-Canada Agreement,” or USMCA. The President Treats the U.N. to a Good Old-Fashioned Trump RallyThe president’s nationalist speech was a list of things that the United States does and doesn’t see as threatening. As Chinese Learn to Cope With Trump’s Trade War, Americans Are Still Set to LoseTrump’s belligerent, zero-sum trade policies will ultimately hurt American consumers and are already driving other countries to work around us. Where Can I Get the Freshest Coffee in the City?A coffee authority knows where to get especially great cups of joe. As Trump Doles Out Tariffs, the U.S. Trade Deficit SoarsThe trade deficit rose 10 percent in July, putting the U.S. on pace for its widest annual gap in a decade. Despite Talks With China, Trump Is in No Rush to Call Off His Trade WarChina is eager to make a deal, but the administration wants to tighten the screws with more tariffs first. Trump Has a Bill That Would Blow Up the WTO. It’s Called the U.S. FART Act.The “United States Fair and Reciprocal Tariff Act” would give Trump unlimited power to wage trade wars. Fortunately, the Fart ACT is just hot air. Trump Slaps Steel and Aluminum Tariffs on the E.U., Canada, and MexicoThe decision is likely to lead these core American allies to retaliate against American exporters. China Hits U.S. With Steep Tariff on Grain ImportsSouthern farmers aren’t going to love this. Trump Looks Into Rejoining the Trans-Pacific PartnershipWithdrawing from the TPP was the one “economically populist” campaign promise that Trump actually fulfilled. Now, he wants back in. We Can’t Stop Using This New Coffee Discovery ToolTrade is a new website that’s basically the Zappos of craft coffee. Trump Cheers on Trade War With China As Stocks TumbleAfter Beijing threatened to slap tariffs on 106 U.S. exports Wednesday, markets panicked — and Trump reiterated his enthusiasm for trade war. Trump Is Preparing More Than $30 Billion in Anti-China TariffsThe president is on the cusp of launching the most aggressive (and, arguably, illegal) trade action of his tenure. Trump Brings Back Ancient GOP Tradition of ProtectionismHe appears to be a true believer in reversing globalization, not just using tariffs as a weapon. That’s both new — and very old — for Republicans. Trump Bids Good-bye to Gary Cohn — and Empirical RealityThe president’s worst impulses had been constrained by deference to the stock market and corporate America. Now, he’s thumbing his nose at both. Paul Ryan and Other Republicans Try to Talk Trump Out of TariffsAt least for a day, the House Speaker isn’t a presidential lackey. Trump: I’ll Lift Tariffs If NAFTA Is RenegotiatedThe president is attempting to bully two close allies into submission. Trump (Finally) Declares Trade WarBy slapping high tariffs on steel and aluminum, the president has brought the GOP Establishment nightmare to life. Amid White House Unrest, Trump Mulls Launching a Trade WarSteel and aluminum executives have been summoned to the White House for a big announcement on tariffs, but the details haven’t been finalized. Among the Globalists in Davos, Trump Warms to NAFTA and TPP“If we did a substantially better deal, I would be open to TPP,” Trump said. The Canadians Think Trump Will Try to Kill NAFTA. Are They Right?The president longs for trade war — but also a booming stock market and the approval of his corporate donors. Trump Takes Rare Trade Action Against ChinaThe Commerce Department just launched a process that could result in steep duties on Chinese aluminum. 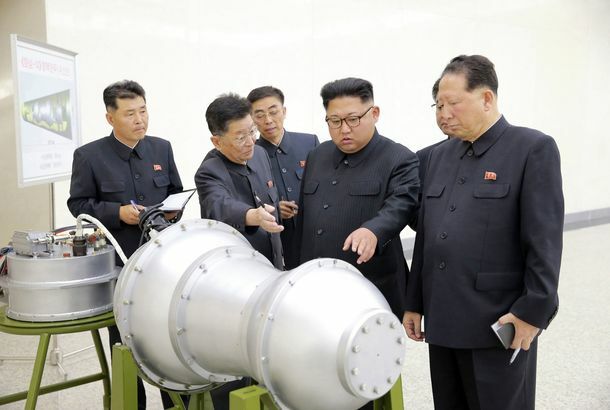 Why North Korea’s Nuclear Test Should Unnerve and Embarrass TrumpThe dangerous escalation proves that the U.S. and its regional allies must put existential questions ahead of political ones. Trump Squandered His Opportunity With Union VotersAs Trump’s approval rating in the Rust Belt dips, labor leaders work to help Democrats exploit an opening with working-class Trump voters. 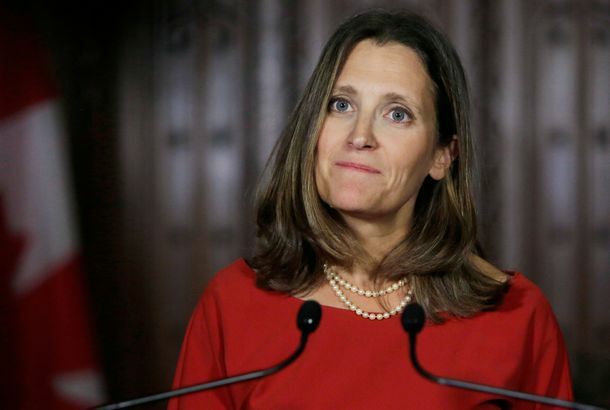 Canada Wants to Include Gender, Indigenous Rights in New NAFTA DealNegotiations on the trade deal begin on Wednesday. Trump Doubles Down on Feud With Germany in Early-Morning TweetAs Germany’s political leaders express their loss of faith in the U.S., Trump vows to change Berlin’s “very bad” conduct toward the U.S.
Trump Reaches Preliminary Deal With China Over Beef and ChickenMonths ago, it looked like Trump might start a war with China. Now, he’s just overhyping deals that modestly improve trade relations with Beijing.